I’ve been collecting a mess of crafting/DIY pins over at Pinterest and decided maybe I should actually try a few of the tutorials I have pinned. 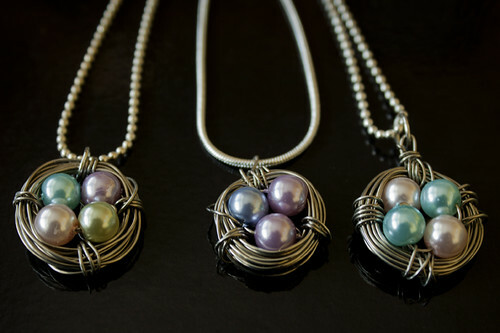 With Mother’s Day quickly approaching, I decided the bird nest necklace would be a good one to start with. Then maybe I would try something new and get a few gifts made. They were easy and fun to make (and strangely addicting). Once I got going on them, I had a hard time stopping. I ended up with a whole mess of them. Not all of them looked nice though. The first few attempts were odd, misshapen and straggly looking. Once I got the technique down they moved along pretty quick. Here are some of the better ones I made today. I don’t know who I am going to give them to. My daughter has already claimed the one in the middle, and I’ll probably keep one for myself.